This exhibition was conceived by Richard Appignanesi and Gülsen Bal to coincide with the appearance of a special issue of the art journal Third Text (published by Routledge Taylor & Francis Group, UK) under the same title, Lost in Europe: in the wake of Britain's inner emigration, edited by Richard Appignanesi. Gülsen Bal is also a member of the Third Text Advisory Board. Britain has entered on the civil strife path of secession from the European Union. The consequences of nationalist-inspired secession have always been historically troubling and of uncertain forecast -- a self-fulfilling prophecy of understatement, to say the least. 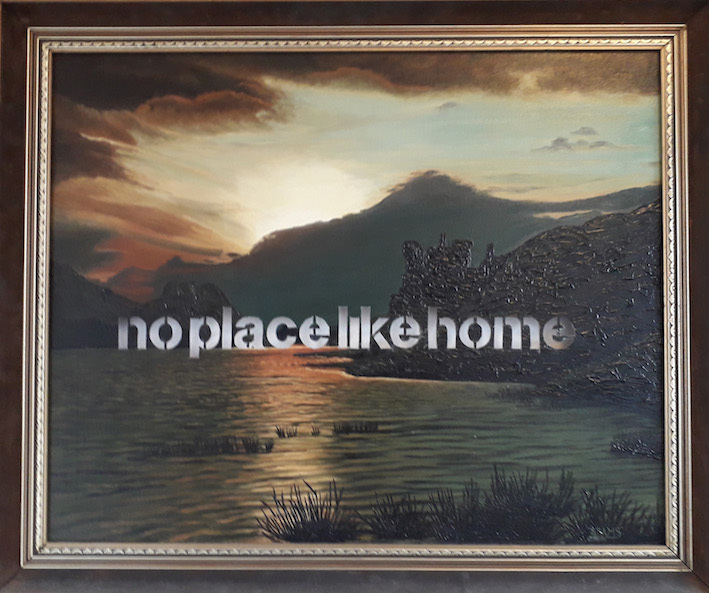 The exhibition project is not primarily interested in the pro-or anti- 'Brexit' issues but rather in the peculiar fait accompli, as it is, that Britain has undertaken a species of inner emigration. No doubt, my contentious terminology adopted from a dark history casts its shadow across the nation, as I intend it to. The point is -- for those artists and writers who might be willing to respond to the invitation premise -- where will inner emigration take Britain? Somewhere, paradoxical though it may seem, lost in Europe. Separatism is incited by fears of impingement, which are inescapable in our global circumstances of social, cultural and economic inequalities. The greatest impinger of all by dint of cultural stealth or outright inflicted power is America -- the far-reaching American Dream -- even apparently diminished as it might now appear. 'Nearly America' is our own encroaching shoreline. I heard it measured in my native separatist Quebec in the 1960s. 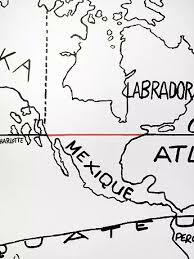 Presqu' Amérique, 'almost but not quite America', as the Quebecois poet and chansonnier Robert Charlebois ironically complains, 'an inch and a half from the United States' on the map, only a thumb's length away from being culturally and economically squashed to extinction. The title London Waiting plays on ‘London weighting’, the allowance additionally paid to help key workers cope with the higher costs of living in London. ‘Waiting’ sounds like ‘weighting’ but refers to the expectation of urban catastrophe. 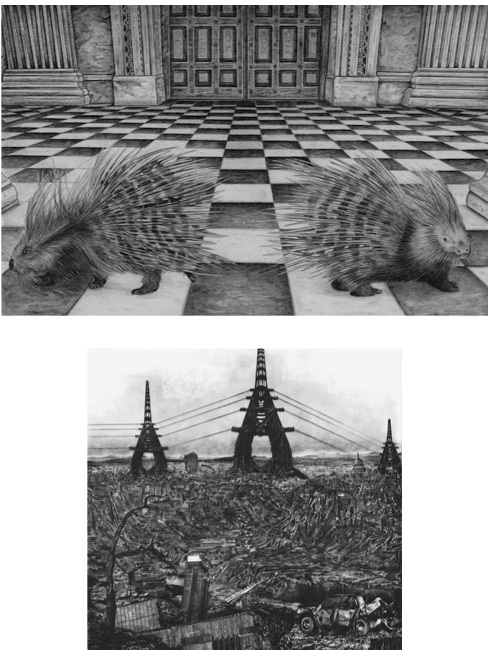 The work Chequered was inspired by Arthur Schopenhauer’s porcupine dilemma: “A number of porcupines huddled together for warmth on a cold day in winter; but, as they began to prick one another with their quills, they were obliged to disperse. […] At last, after many turns of huddling and dispersing, they discovered that they would be best off by remaining at a little distance from one another.” This seems to me a telling comment on the Brexit poles of attraction-repulsion. friends, statesmen cannot.”, *Les hommes peuvent avoir des amis, pas les hommes d'Etat." (in Interview, December 9, 1967) is now increasingly being referenced in the 'post Brexit' discussions. I'm thinking that my subtle reworking of the surrealist map with attention to European (dis)Union and/or the Spectres of Marx... "a [new] Spectre is Haunting Europe...." will be the most appropriate works to present in the context of the Lost in Europe themes. Wall drawing/painting, erasure and time-lapse video documents would be employed in both projects. On July 1995 Yosefa Loshitzky and Haim Bresheeth (žabner) went on a honeymoon trip to Europe. What may have looked like a traditional destination choice for a newly married couple was in fact nothing of the sort for Haim and Yosefa, two Israeli dissidents living in London. Among their more predictable choices of conventionally attractive places such as the French countryside, the Swiss Alps and the like, their trip also included visits to the Treblinka, Majdanek, and Auschwitz-Birkenau camps, as well as to the birthplaces of their Polish Jewish families who were exterminated by the Nazis: Sokolow Podlaski in North-Eastern Poland, where Yosefa’s family came from and Ostrowiec świętokrzyski in Galicia, where Haim’s parents came from. Tracing the origin of their lost families and visiting some of the places where their parents stayed during and after World War II, prior to their migration to British Mandate Palestine (which later became Israel), has turned for Haim and Yosefa into a roots journey to the void left by the destruction of European Jewry. When they returned from their European tour to their home in London they jointly designed and constructed a memory box where each compartment visually and symbolically represents a place of memory (Lieu de memoire) from their trip. Yosefa and Haim’s bitter-sweet European honeymoon is revisited in their memory box video ‘The Last Honeymoon in Europe’ which explores these places of personal and collective memory and challenges conventional understandings and assumptions regarding what it means to be a non-Jewish Jew, a former Israeli and an anti-Zionist Jew in contemporary Europe. The video work Belgique stands on the liminal borderline of Europe. It also a memento to Marcel Broodthaers and Rene Magritte, besides being anchored to colonial history, both Belgian and more generally, as I think of the description of the rusting hulks along the Thames at the opening to Conrad's Heart of Darkness. It was finished on 20 June 2017, on the day of the failed terrorist bombing in the Brussels train station, which tended to confirm a rather tragic atmosphere emerging from the images, shot in different conditions, historically and meteorologically, over some three years. 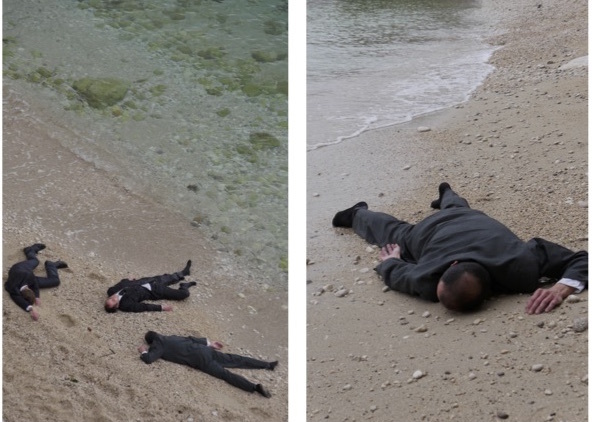 The photographs Stranded show men lying motionless on an empty beach. But unlike refugees these men wear business suits, the standardized clothing of politicians and managers. Their bodies are partly in the water, partly on the beach; they appear to be stranded. These images could be seen as depicting those responsible for the policy of drowning refugees. The current European Union measures go beyond “refugee deterrence”. Today the EU makes use of the catastrophe it caused itself (through support for dictatorships, political intervention in uprisings, continuous wars on terror and economic strangulation of Africa and the Near East) to prepare renewed military intervention behind the back of the population. The work presents tercets from ’Là Buidhe Bealltainn’, by Rody Gorman, in a visually totemic form which iterates the more ancient vibrations present in the Gaelic poet’s words. This is augmented by a broad series of ‘Scottish’ iconographic images influenced by the notions of ‘imperial fantasy’ which have surfaced through the murky waters of the Brexit debate and the fallout surrounding Scottish national identity and power of democracy in the aftermath of the recent referendums on the future of the nation. 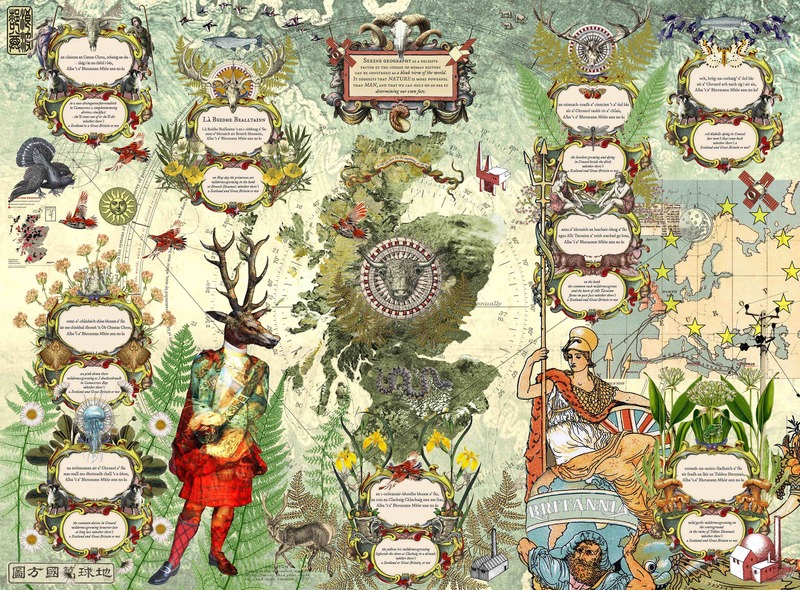 A hybrid Actaeon/Charles Edward Stuart/landowner figure and Brittania (from Walter Crane’s occasionally subversive ‘Imperial Federation Map of the World Showing the Extent of the British Empire in 1886’) preside over the visual interplay. Any concomitant narrative is at the viewer’s discretion. Diptych: La Familia $rump & The president that we deserve? In 1898 and again in 1943, the US military invaded the Philippines; 1890 US troops invade Argentina; 1891 invade Chile; 1891 invade Haiti; 1894 invade Nicaragua; 1898 US Navy invades Cuba and Puerto Rico; 1903 Marines invade Honduras; 1906 troops in Cuba; 1907 Nicaragua again (also in 1910, 1912-1933); 1923 US troops in El Salvador; 1947 Uruguay; 1954 Guatemala; 1950 US military massacre civilian refugees No Gun Ri Korea; 1968 US military massacre civilians My Lai Vietnam; 1983, U.S. troops invade Grenada; 1988-1990 U.S. air force and troops invade Panama; 1992-1995 U.S. led intervention in Somalia; 2003, U.S. military invades Iraq; 2002 to present day the US carries-out ongoing lethal drone strikes and special operations in Yemen, Somalia, Libya, Afghanistan, Algeria, Iraq, Iran, and Pakistan. What if we have seen the enemy and they is us? Armchair Painting is one of an ongoing series of works that began in 1989 collectively known as the Armchair Paintings. Toren buys ‘thrift-store’ paintings and then cuts the text into the picture plane. The language is taken from different sources: graffiti, signage or overheard phrases, and the dissonant combination of text and image creates new meaning. 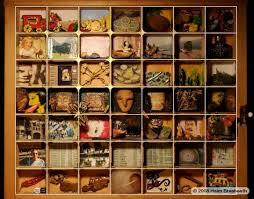 These works are what Toren refers to as ‘adjusted readymades’ – found objects he alters to reconstitute meaning. We are familiar with Paul Virilio’s critical work on the German bunkers of the ‘Atlantic Wall’ defenses of World War II. 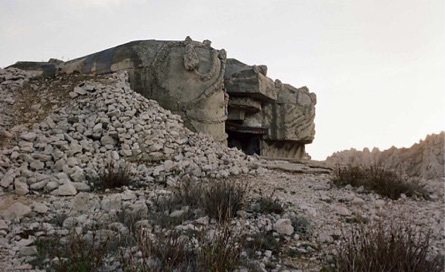 Margret Hoppe has originally researched and photographed the less known ‘Südwall’, the Germans’ bunker defenses along the Mediterranean coast, in the Marseilles vicinity. Along with them, she has documented a series of empty rooms and a site of ruins where refugees from the Gestapo and the Vichy regime were hidden during the war, places were Varian Fry, a young editor from New York, ran his Emergency Rescue Committee.